We plant trees throughout Wisconsin in partnership with the Wisconsin Department of Natural Resources. By aiding the DNR, we can be assured that we are planting the right trees in all the right places. This ensures that the results of our tree-planting efforts are long-lasting; that the trees we plant are safer from the perils of drought, disease, and development. There are two programs in the DNR through which we contribute and participate. Reforestation and wild life habitat preservation projects in state forests and state natural areas. Every Arbor Day funds provided by Northwoods Casket Co. go toward tree planting celebrations in communities around the state. 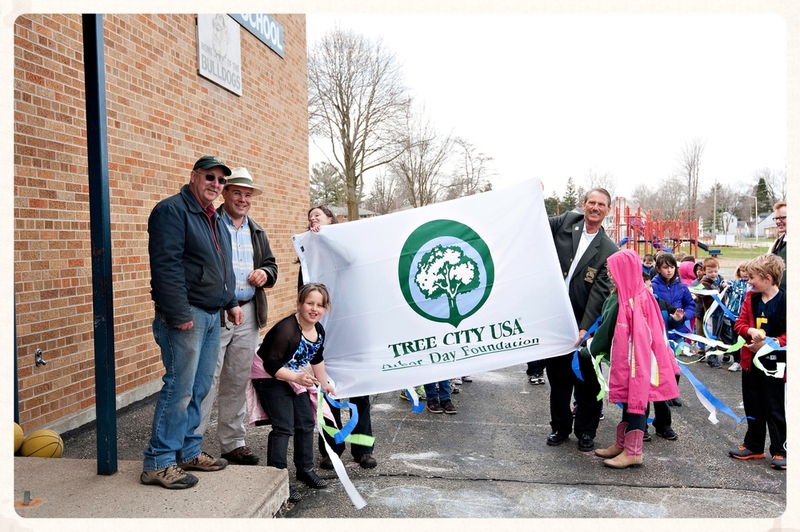 The photos here are from Arbor Day Celebration 2013 at Washington Elementary School in Beaver Dam, WI. Arbor Day at Washington Elementary School with John Neumann (city forester), Jonas Zahn (Northwoods Casket Co.), Olivia Witthun (WI-DNR Urban Forestry Division), and Mayor Tom Kennedy. Washington Elementary kids planting trees on school grounds. City of Beaver Dam parks & forestry team teaching children the importance of planting trees. Northwoods Casket Co. provides funds for the city tree nursery that raises trees from whips (the size of a pencil) to an age of 3-7 years when the tree can be transplanted in city street terraces, parks, municipal lots, or private residences. Jonas Zahn (Northwoods Casket Co.) and John Neumann (City of Beaver Dam Forester) planting a tree together in April, 2013. In April of 2012 we contributed to planting 15,000 white pine, oak, and cherry trees in the Kettle Moraine State Forest Northern Unit near Sheboygan, Wisconsin. These trees were planted for the purpose of wild life habitat restoration and reforestation. A healthy and diverse forest protects the landscape and creates a rich wild life habitat.